The main biotechnology tools developed by Cellectis are based on the properties of meganucleases, natural “molecular scissors” that can cut DNA at a precise site specific to each meganuclease, the company reports. It claims that once the cut has been made, it is possible to remove, integrate, or substitute a portion of DNA with the same degree of precision. Having worked with meganucleases since 1988 at the Institut Pasteur in Paris, Dr. Choulika is a pioneer in the field and the author of numerous patents on the use of meganucleases in vivo. His research team discovered meganucleases—enzymes that promote DNA transfer—in Saccharomyces cerevisiae. The researchers moved on to retroviruses and DNA recombination in mice. When they experimented with meganucleases in mammalian cells, they incorporated the recognition site of a meganuclease they were working on into a retrovirus, tried the DNA scissors out on infected cells, and discovered that the retrovirus disappeared. “We could remove the virus from a cell, which was a total paradigm shift at the time in terms of our way of thinking about antivirals,” Dr. Choulika says. Cellectis has developed various genome engineering applications that are based on meganucleases. Its proprietary process involves introducing a meganuclease that is specific to the targeted site into the cell and inserting a gene with the attributes required to stimulate homologous recombination. The meganuclease breaks the DNA molecule, and the homologous recombination system corrects this break by taking as a model the gene introduced at the same time as the meganuclease. Realizing that “changing the specificity of these enzymes—allowing them to target desired sites precisely—would make a tremendous tool for genome surgery and an excellent basis for a company,” he founded Cellectis in 1999 along with David J. D. Sourdive, Ph.D., who has served as director since 2000. Cellectis was founded with exclusive technology licensing from the Institut Pasteur. In 2000 it won a competition sponsored by the French Higher Education and Research Ministry to help in the development of the company. In 2002 the firm raised substantial venture capital. Cellectis scientists discovered a way to generate meganucleases on an industrial scale in 2004, the same year the company moved to its current headquarters outside of Paris. To date, Cellectis has established more than 50 agreements with pharmaceutical laboratories, seed producers, and biotech companies across the world. The company has also formed over 20 academic research partnerships. Human health: the replacement of a defective gene by a functional gene (monogenic diseases such as muscular dystrophy, myopathies, or hemophilia), the elimination of persistent viral DNA (AIDS, hepatitis B, or herpes viruses), and the creation of stem cell lines with particular characteristics. Cellectis is particularly involved in the research and development of therapeutic solutions alongside the French Muscular Dystrophy Association, the Necker-Enfants Malades Hospital, and the Vision Institute. Agrobiotechnology: the improvement of certain properties of plant crops by the replacement, addition, or suppression of genes of interest or the modulation of their expression. Five of the world’s leading seed producers—BASF, Bayer CropScience, DuPont, Limagrain, and Monsanto—use Cellectis technologies, the company says. Research and biomanufacturing: through its subsidiary Cellectis Bioresearch, the company markets its cGPS® (cellular genome positioning system) and cGPS Custom families of kits for the in vitro modification of cell lines. During the last two years, Cellectis has established two other subsidiaries to develop the applications of meganuclease technology in a given market sector. Cellectis Genome Surgery is dedicated to the development of therapeutic approaches to using meganucleases to treat genetic diseases, cancers, and persistent viral infections. Ectycell, established a year ago, is developing tools for generating pluripotent stem cells from adult cells; robust, reproducible differentiation of stem cells; and cell libraries for testing drug candidates. 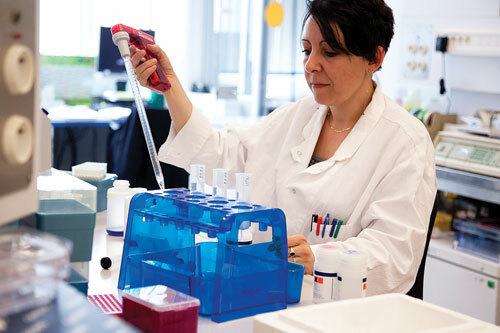 Over the past five years, Cellectis has built an archive of more than 20,000 well-characterized meganucleases—the Omega base, which researchers have used to generate improvements in the manufacture of new meganucleases, Cellectis says. By constantly improving its engineering processes, the company has reduced the time required to produce a new meganuclease from nine to three months in most cases, according to Dr. Choulika. Each year, Cellectis designs and produces dozens of meganucleases with modified specificity, tailor-made for researchers and engineers in state-funded and private laboratories and for clients in industry. These enable controlled, rapid, safe, and reproducible modifications of the targeted DNA portion, Cellectis claims. These collaborations, along with an active technology outlicensing program and a rapidly expanding line of commercial research kits, have added up to steady revenue growth for the company. Cellectis expects to launch dozens of new research commercial products during 2010 and aims to reach sustainable profitability in 2011 or 2012. While none of the Cellectis products are marketed for therapeutic applications, the company is partnering with pharmaceutical companies to sell them eventually. “By gaining knowledge of DNA traits related to ailments, researchers can develop gene-based treatments that have the potential to directly address medical conditions, rather than simply alleviate the symptoms of those diseases, so that a disease will not be seen as symptoms to be healed but as a DNA-based malfunctioning that can be fixed,” Dr. Choulika explains.